getcalc.com's Coulomb's Law Calculator is an online physics tool to calculate the magnitude of resultant attractive or repulsive electrostatic force between two charged objects Q1 & Q2, in both US customary & metric (SI) units. 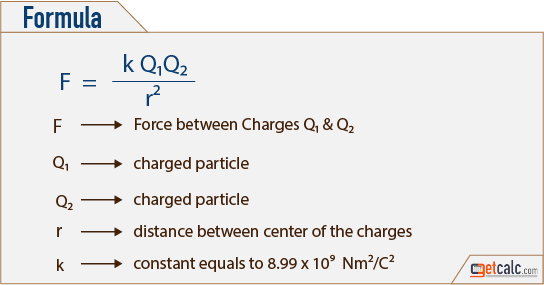 Coulomb's Law states that the electrostatic force between the two charged objects is directly proprtion to the magnitude of each charge Q1 & Q2 and inversly proportion to the square of distance between the centers of Q1 & Q2. In other words, the attraction or reflection between two charged objects is directly prportion to the magnitude of each charge Q1 & Q2 and inversly proportion to the square of distance between the centers of Q1 & Q2.